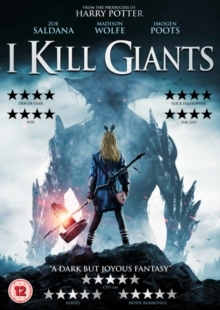 Fantasy adventure drama based on the graphic novel 'I Kill Giants' created by Joe Kelly and Ken Niimura. The film follows Barbara (Madison Wolfe), a young girl who finds solace in the lonely world in which she slays monstrous giants. Thought to be the subject of a vivid imagination, her teacher, Mrs. Mollé (Zoe Saldana), attempts to reach out to Barbara in an attempt to bring her back to reality. However, when Barbara befriends another young girl named Sophia (Sydney Wade) she endeavours to introduce her to her dark and magical world and prove to her that giants do indeed exist and that they are out to destroy. With Barbara and her new friend getting into ever more dangerous situations, will they be able to prove to the non-believers that the giants are real, or are they simply a creation of Barbara's imaginative mind?